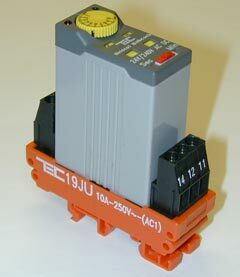 Universal timer relay 1 contact. Mounting on symetrical or dissymetrical DIN track by screw terminal. See the operation scheme hereafter. Visualisation of function state by red LED and of voltage presence by green LED. !! any modification of the choice of the form or of the multiplier of a timing in use will be validated only after a switch-off of the power supply ! !